Reminiscent of an oasis in the desert, Holiday Inn Casa Grande is centrally located between Tucson and Phoenix. Our hotel features upscale contemporary decor, peaceful sleeping rooms, ample meeting space for leisure or business travelers, and a beautiful full service restaurant and lounge. No matter what brings you to town Holiday Inn Casa Grande is your home away from home. Pricing is based on events ranging from 100 - 250 people. 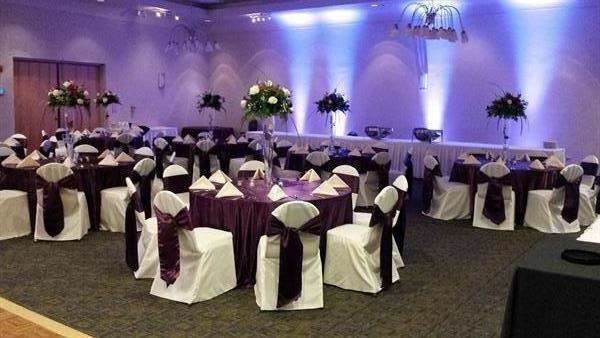 Prices include room rental, bartender, security guard, chair covers, over layers and catering. Bartenders, chair covers and over layers are optional. To secure a date a 10% or $500.00 deposit (which ever is greater) is required. This deposit is non-refundable, but does go towards your balance. Events must be paid in full two weeks prior to the event date. Personal checks are only accepted 30 prior to event date; cash, money order, or a cashiers check is an acceptable tender past the 30 day time line. In order to avoid cancellation fees, an event must be cancelled 100 days prior to event date. Our Canyon Room is located on the first floor near our lobby. This room is great for small meetings, baby showers, or a meet and greet. It can accommodate 15 - 40 people depending on desired setup. Catering arrangements are also available if needed. Our Citrus Room is located on the first floor near our lobby. This room is great for small meetings, baby showers, or a meet and greet. It can accommodate 15 - 40 people depending on desired setup. Catering arrangements are also available if needed. Rather it be work related or personal,our private executive boardroom makes the perfect work space for any type of meeting. It's located near the entrance of our lobby, and seats 8 people comfortably. A few more chairs can be added if needed. Special Features: Our Executive Board Room is located near the entrance of our lobby. A telephone is available for local and/or toll free calls. We offer wireless internet and A/V equipment if needed. Catering is also available for this room. Our beautiful ballroom makes the perfect place to host your next business or social event. We have built in house sound to accommodate slide shows, music, or power point presentations. Portable microphones, screens, projector, dance floor and a stage is also available if needed. Catering arrangements can be made with Cabos restaurant. The entire team here at Holiday Inn Casa Grande is sincerely dedicated in making sure that every event is special and memorial for all our guests. Special Features: Our ballroom features sound capabilities for music, slide shows, or power point presentations. Portable screens, 1 projector, podium, 2 standard wireless microphones, portable stage, and dance floor.